The end of the growing season is the ideal time to clean, sanitize, and organize your greenhouse. You’ll help keep pathogens from overwintering in your greenhouse (some can survive even subzero temperatures) and create a smoother start to next year. We call that working smarter, not harder, and to help you, we created a Fall Greenhouse Sanitation Guide. 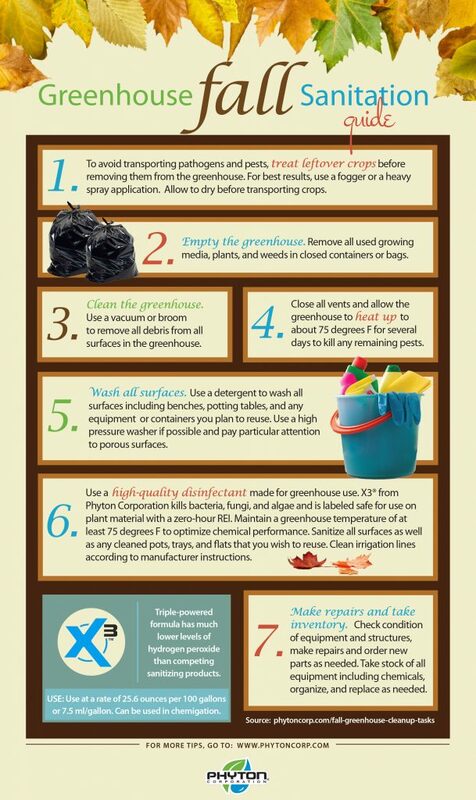 Use our guide to help you clean and sanitize your greenhouse the right way. You’ll reduce your exposure to pathogens, which will save you money on next year’s greenhouse chemicals and lead to healthier plants that will boost your sales. Download our colorful guide now for yourself, or share it with others. P.S. It’s designed to fit a legal size sheet of paper, so you can easily print and post!